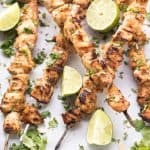 Paleo + Whole30 Thai Chicken Satay Skewers Recipe – a healthy and delicious dinner of chicken skewers marinated in a paleo + whole30 chicken satay sauce made with almond butter. Gluten free, grain free, dairy free, refined sugar free, clean eating, real food. If you’re looking for chicken skewers jam packed with tons of thai flavors, you’ve come to the right place. These paleo + whole30 thai chicken satay skewers are phenomenal! 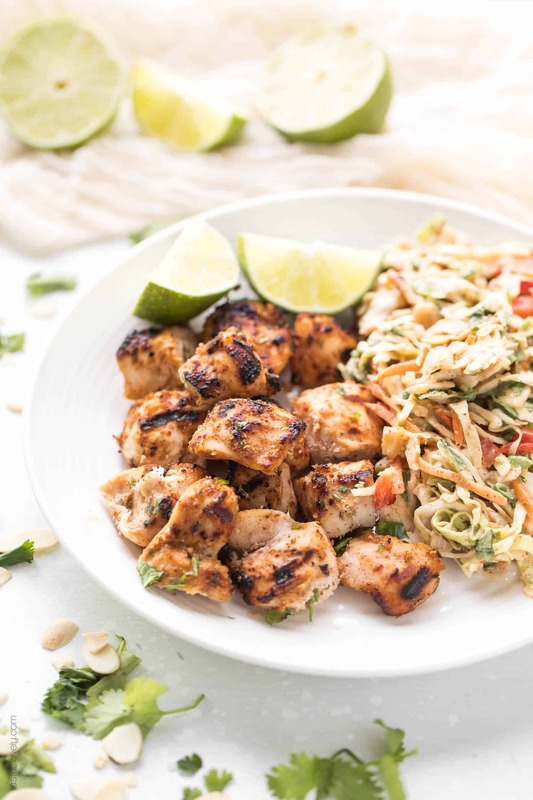 Everything you love about chicken satay skewers, but a healthier version that is paleo + whole30 approved. If you remember last week, I shared my paleo + whole30 thai almond butter coleslaw, and teased that I had the perfect protein to go with that cabbage coleslaw. 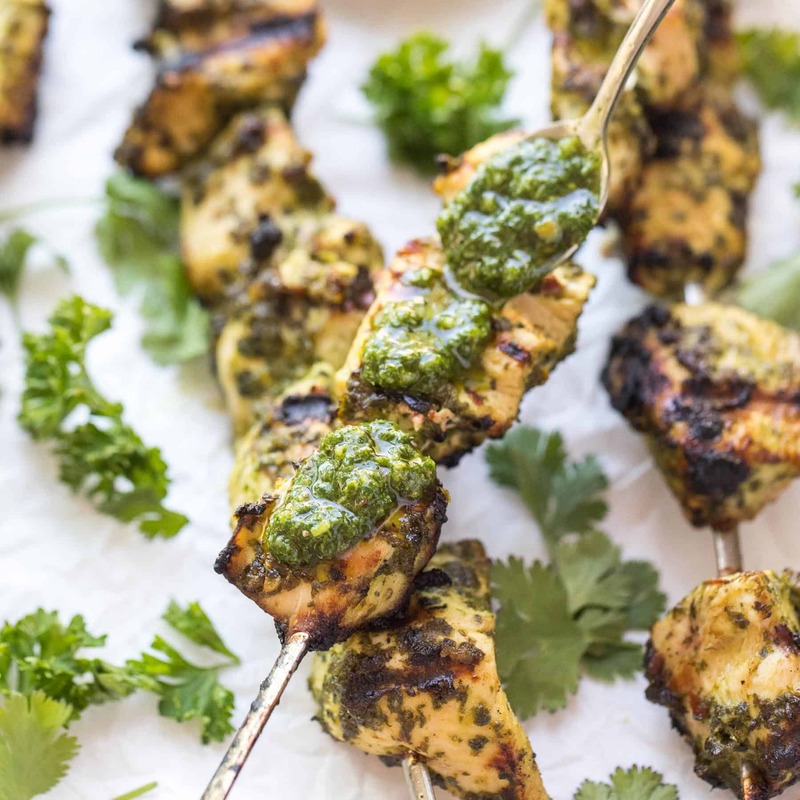 These paleo + whole30 thai chicken satay skewers are them! 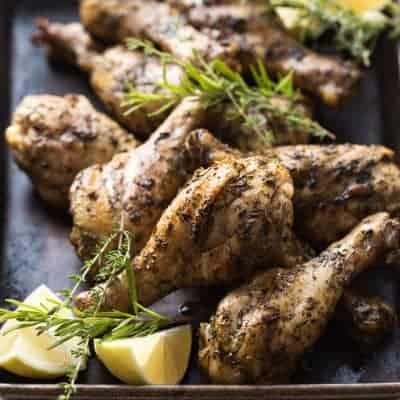 The chicken is marinated in a delicious thai almond butter satay sauce made with delicious ingredients like almond butter, coconut aminos, honey, lime juice, sesame seed oil, rice wine vinegar and ginger. It is earthy, bright, sweet and acidic. I want to put this sauce on everything. And if it looks familiar, it’s because it’s the exact same dressing I use in my paleo + whole30 thai almond butter coleslaw! Just double the sauce recipe, use half in the coleslaw and half in the chicken marinade. So easy! 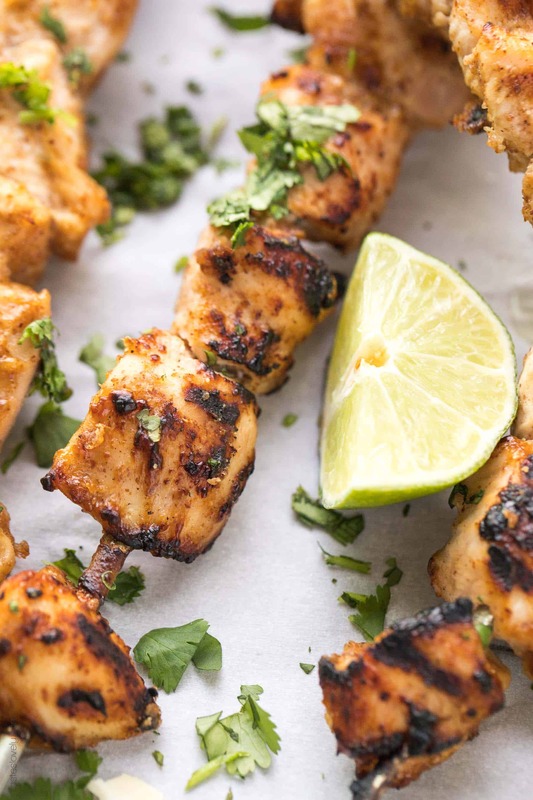 You want to marinate the paleo + whole30 thai chicken satay skewers for at least 20 minutes if you’re in a hurry, or up to a day if you’ve planned ahead. 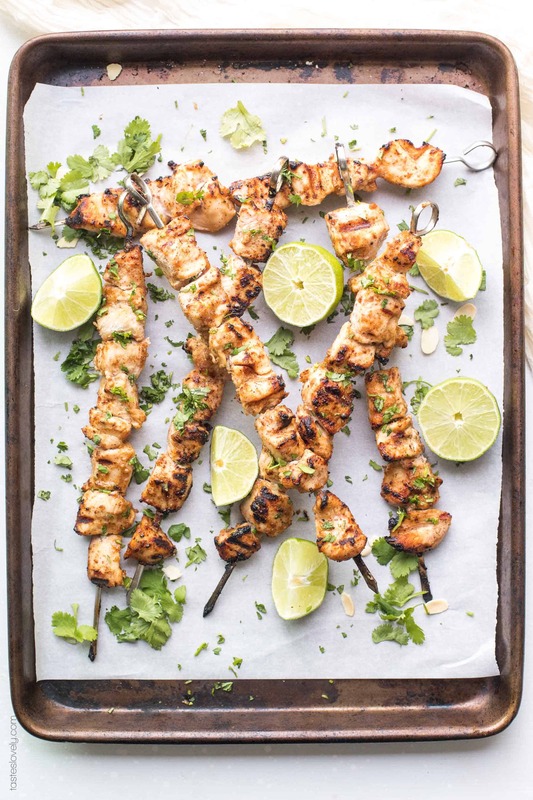 The skewers take about 10 minutes to grill, making this such an easy 30 minute dinner recipe. Plus, since you’re grilling outside it doesn’t heat up your house! 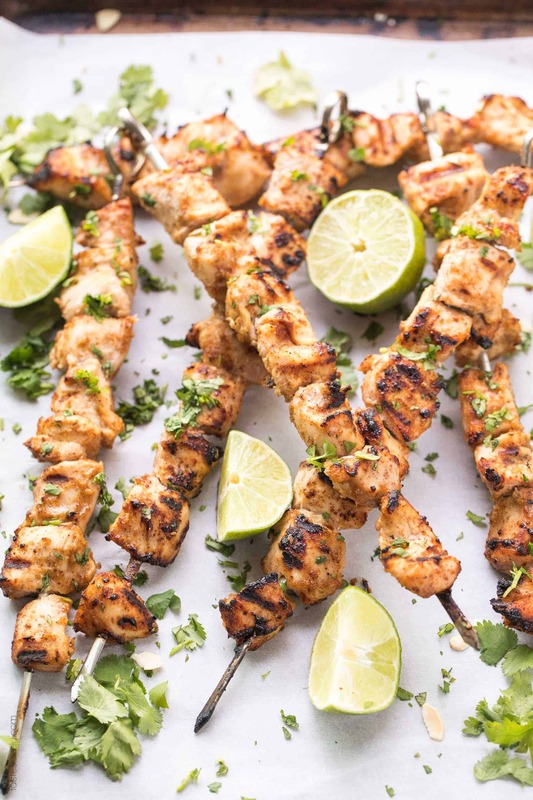 As you’re grilling the paleo + whole30 thai chicken satay skewers, the honey in the marinade gives the chicken a great caramelization that you are going to love. It is absolute perfection served with my paleo + whole30 thai almond butter coleslaw. 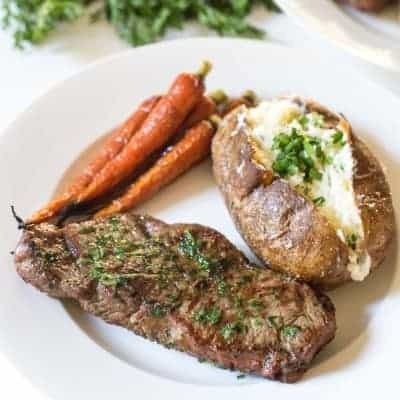 An amazing summer grilling meal. 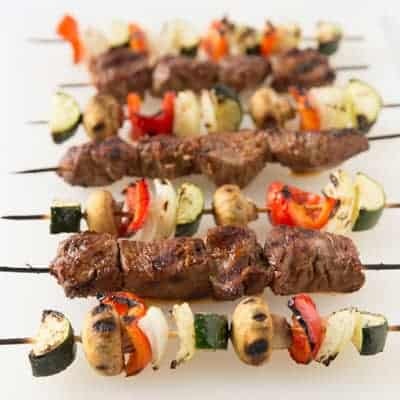 You could also serve these skewers as an appetizer! Not only is it delicious, but so healthy! Paleo, whole30, gluten free, grain free, dairy free, refined sugar free, soy free, clean eating, real food. 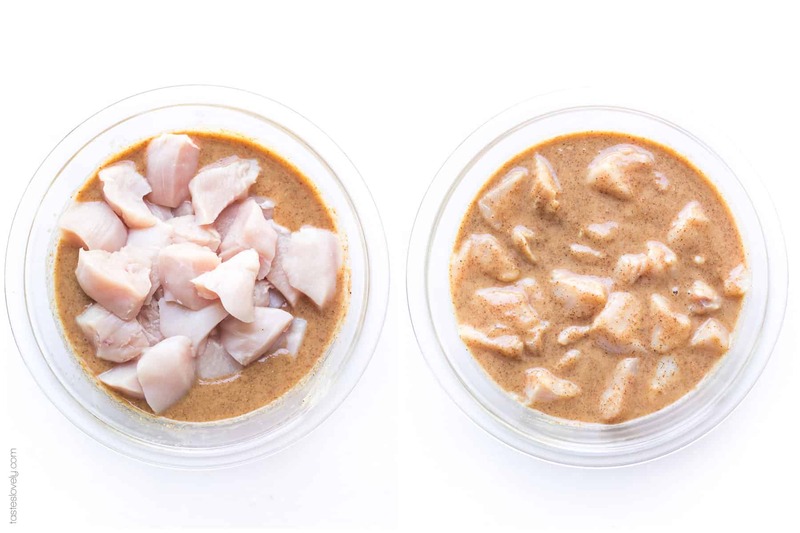 In a medium size mixing bowl, make the almond butter satay sauce by combining the almond butter, rice wine vinegar, honey, sesame seed oil, olive oil, coconut aminos, lime juice, ginger and salt. Add the cubed chicken to the almond butter satay sauce. Cover and marinate for at least 20 minutes, or up to 24 hours. Remove the skewers from the grill and allow to rest for 5 minutes. Serve warm. These are especially good served with my paleo + whole30 thai almond butter coleslaw. If you’re serving this with my paleo + whole30 thai almond butter coleslaw (you really should! ), double the satay sauce recipe. Use half for the skewers, and the other half for the coleslaw. For Whole30, substitute 3 (or more to taste) soft, pitted dates. Make the sauce in a high speed blender to make the satay sauce so it will puree the dates. Follow the rest of the recipe as usual. It sounds amazing and I cant wait to try it. I am going to substitute the rice wine vinegar as it is made from a grain and not “Paleo” but i am going to try it with apple cider vinegar. Thank you and please keep sharing!!!!! Great idea substituting apple cider vinegar for rice wine vinegar! I’m so happy you liked these. Your comment made my day! Thanks for reading along and letting me know you liked my recipe. I’ve got plenty more recipes to share, and hope you keep enjoying them! Oh my goodness… I made the slaw recipe you mentioned with a pack of pre-shredded coleslaw mix first, and was in love with the first bite. I just KNEW the chicken was gonna be to die for, so I made a double batch to have work lunches for the next few days!!!! I’m so glad you liked it Amyadell! Isn’t it so delicious? That sauce! Thank you for taking the time to let me know you liked my recipe. You just made my day!